As I stated previously, this series of articles are solely for the benefit of people who have no previous experience and would like to learn the process of creating your own game app from beginning to end. In the previous article, how to create a game app, we discussed choosing an idea for your new Android game and if you've not read it then you might want to read that article quickly first. The link above will open in a new window so you can come back and read this after. It's important to do everything in the correct order to save time and to speed up the entire process. What we are going to discuss in this post is getting the preparation and layout on paper first. Planning is absolutely vital because there are a lot of things to consider and missing a detail at the offset can cause a huge amount of work later on. For example, when I created my Android game I decided that it was going to be a paid app without doing the proper research. When my game was complete I then found out to my horror that the best way to market my game was to make it freemium, offering the first part of it for free so people can try it before they decide to buy it. The conversion rate from free to paid is terrible with only about 2% of people that install your game forking out real cash to buy it, hence having ads in your game is vital if you want to make any money from the freeloaders that make up the vast majority. Making space at the top or bottom of the screen for banner ads was now impossible in my app because I would have had to redraw the entire GUI (Graphical User Interface) and re position all the other graphics too, it would have taken months. I was left with only one option and that was to use interstitial ads, these are full screen ads that you display in between scene's within your game's flow. Should your app be free of paid? This is something you need to decide right now because of what I mentioned above. If your app is going to be free or freemium then you will need to make space for ads. This decision is not an easy one and should not be taken lightly and there are a lot of conflicting articles out there. In my honest opinion I think the choice largely depends on your game model, for my pub quiz game the freemium model fits beautifully because I have 3 worlds and giving users the first world free makes sense to me. I have great confidence that once players experience the first world they will be hungry to unlock the rest of the game and I'm hoping that the conversion rate from free to paid will be a lot higher than 2%, right now it's standing at 2.7% but it's still early days. There is a good argument for going paid, especially if your an indie developer with a small budget. Having a price attached to your app gives it value and this begs the question, how much do you charge for your app? This also depends on the app, if it's a sprawling game with tons of content then I think $3 to $4 is a fair price, if it's a simple game like Space Invaders then $0.99 makes more sense. Bear in mind that the app stores are going to take a third of that and you also have to take tax or vat off that too.Starting with a higher price tag gives you the option of having a sale in future and I strongly suggest you take this route. If you are struggling to make up your mind then this article might help, Paid, Paymium or Freemium, and Your free app will make you broke is also worth reading. If you want to go the free route then you will need to think about in app purchases, is your game going to use it's own currency, coins, jewels and so on? The best Android games carefully balance the difficulty so that players can still play the whole game without having to pay for in app purchases but the game is a lot easier or a lot more fun if they spend some real money. Planning this early on is a good idea as you are going to have to base your game mechanics around a carefully orchestrated rewards system. At this stage you should have a unique game idea and you should have decided whether or not you are going to have ads in your game. Your next job is to get your idea on paper, if you don't have a large A4 pad of paper then I recommend you go out and buy one now. 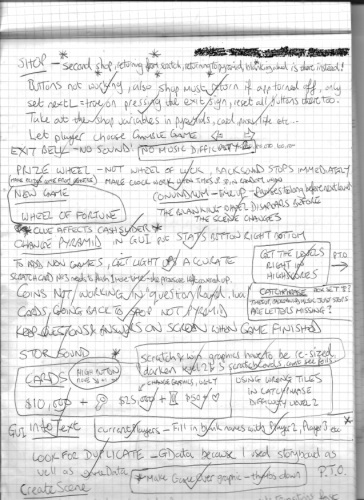 When making a new game you are going to take a lot of notes and it's also good to have a pen and paper handy to write down game ideas as and when you get inspiration. 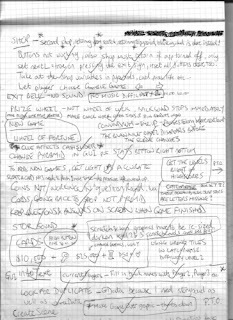 I've got hundreds of pages of notes I wrote down when making my game and I also did a lot of to do lists that I would tick off when I'd done each job on the list. First of all decide if your game is going to be in portrait (upright) or in landscape then draw 3 or 4 empty boxes to represent the screen on each A4 page, the number of screens your game will have will vary obviously. This is the hardest part of game design but is the most important as this is the foundation that you will be working from when it comes to actually programming it. Take your time and be prepared to spend many hours on this part. Think of the menu first, are you going to have high scores, world high scores, trophies, collectables, unlockable levels, side games, a shop and so on. How are you going to have the different parts of the menu come on screen? Slide in left, right, up or down at the tap of a button or scroll into view using finger swipes? What is the theme, what are the colours you would like, what do you want the buttons to look like? When drawing your main game screen think about the score system, is it points based or coins or gems or something else and think of the best place to put them. Will you need lives or a health bar instead? Not all games do. Are you going to need buttons that control your ship, car, character or is it just a simple tap anywhere sort of game? Are you going to have a pause button or a quick restart button or a quit button? These things all need to be incorporated around the edge of the screen into what we call the GUI (graphical user interface) and is an integral part of the game and should be carefully designed and given a lot of thought. Don't forget to draw a banner top or bottom if you want to incorporate ads so you don't forget to make space for them when designing your GUI. You are probably going to make a lot of mistakes to start with or you will think of something new to add or forget to put something in so be prepared to redraw your screens over and over. Don't rush this part, if it takes days so be it, you have to think of everything you possibly can as this will save you a lot of time in the long run. I'm going to finish this article here as you've got a lot of work to do and a lot to think about. The next article in the series is going to be about making or sourcing the graphics you are going to need. It's no good programming without the game's assets, the graphics need to be made first. I strongly suggest you get everything done that I've mentioned in this article before reading further. Please leave a comment if you have any more questions or even just to say hello! Our motto, "It's better to give than to receive."